Polish your windows with an innovative cleaning technique that has met the demands of over 94% of our customers in Malden! Q: What does the window cleaning in Malden involve? A: Our service will be carried out by seasoned and background-checked Malden window cleaners. They'll also be dressed in branded uniforms, so you'll easily identify them as soon as they arrive at your building. A: Essentially, this is an extendible pole that shoots water under powerful water pressure. It allows the technicians to reach the fourth storey of any business or domestic building from the safety of the ground. Q: Will you your gear to my building's water source? A: Not at all! The team will utilize a special de-mineralised water container inside their van. However, if the tank is empty, we will happily take your offer. A: You must make sure that there will be a unoccupied parking spot within 30 metres from your premises and on the same side of your windows. The technicians also need to have an easy access to your property. With our window cleaning in Malden, you get a meticulous clean of your sash windows, skylights, conservatory roofs, French doors, and other glass surfaces at modest fees. We will even provide you with a free wash of all PVC & UPVC window elements! For a complete list of our prices, please see our price table below. We've created our window cleaning in Malden with versatility in mind. As a result, our service is now frequently hired by commercial and household customers alike. Let's go over our window cleaning choices on offer. With our exterior cleaning, you can deftly polish the panes of any building with four or less floors. The practiced experts will show up in a cleaning vehicle. The window cleaners in Malden will then link a handy water-fed pole to the van's water storage. The special purified water will be released through a brush-head add-on at the pole's end under high pressure. When the water evaporates under the sun, your glass façade will stay smudge-free for weeks to come. 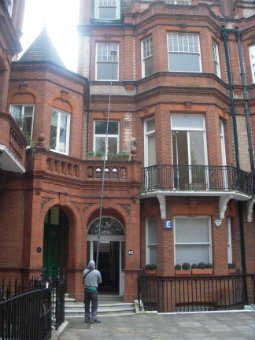 For premises above the fourth floor, we'll send in practiced climbers for rope access window cleaning. Equipped with sturdy ropes, cherry pickers, and ladders, they will analyse and rejuvenate any lofty commercial property over the course of one afternoon. Should you need risk appraisal reports, we'll readily provide them for you. We also take our work to heart and will follow all safety regulations. If your windows are soiled on the inside as well, the cleaners can offer inside cleaning with ladders and sponges. As we received more and more positive reviews from our clients, the request for window cleaning in Malden has noticeably skyrocketed in close by areas. You can find the locations we've included in the list below. Another quick and easy way to get a free instant quote or to book window cleaning services Malden KT3 is through our web site.